Over recent years, much of the debate surrounding the present and future state of Havana’s (and Cuba’s) housing sector has centered around the legal and economic issues related to restitution and compensation for confiscated properties, and strategies to stimulate much needed investment in this vital sector of the economy (e.g., Ashby, 2004, 2005; Driggs, 2005; Clark, 1999). Other experts and scholars (e.g., Scarpaci, Segre, and Coyula, 2000; Coyula and Hamberg, 2003; Pérez Villanueva, 2000; Padrón Lotti, 1998) have focused their attention on the relationship between the importance of historic preservation, the desperate need to alleviate Havana’s housing crisis, and economic efficiency, while addressing the monumental task of rebuilding the city’s basic infrastructure during the process of transition. However, with few exceptions (Coyula and Hamberg, 2003), affordability by the less privileged sectors of the population, and the potential role of housing cooperatives in promoting sustainable affordable housing, has been excluded from this debate. Historically, housing cooperatives have been used to stimulate capital formation and improve the quantity and quality of affordable housing in major urban centers like New York and Paris (Sazama, 1996). This property form provides economic incentives and social opportunities for individuals interested in controlling their environment and improving the quality of their lives. Given Cuba’s tradition of cooperative- based “self-help housing,” and relatively high rates of homeownership, housing cooperatives represent a viable alternative to improve the quantity and quality of the country’s urban housing, particularly in Havana. 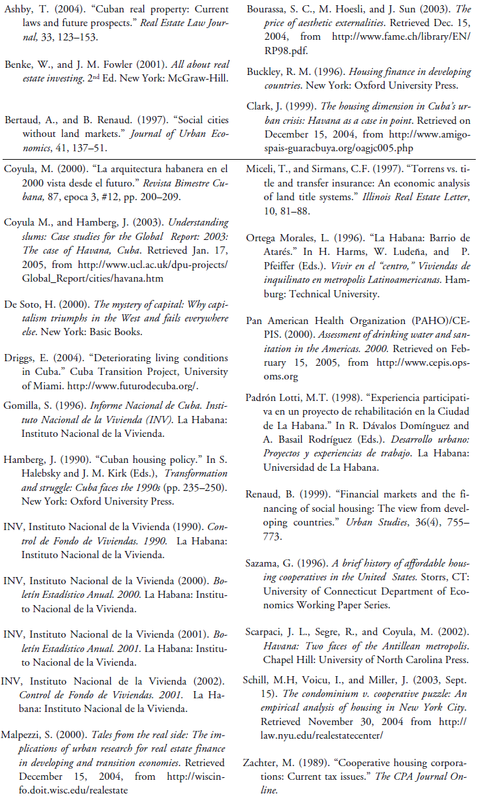 This paper describes the possible roles of housing cooperatives in the transformation of Havana’s residential sector. The first section of the paper provides a summary of current conditions in Havana’s housing sector. This is followed by a discussion of the principal characteristics of housing cooperatives and the factors that determine their value. The last section analyzes the potential roles of housing cooperatives in the transformation of Havana’s residential sector and the challenges ahead. Havana’s substandard dwellings include more than 7,000 ciudadelas and cuarterías, and 186 barrios insolubres (Scarpaci, Segre, and Coyula, 2002). In 2001, there were 60,757 tenement units in 6,932 buildings in Havana, representing 10.35% of the total housing units in the city, and housing 205,564 residents, or 9.4% of the total population (INV, 2001; Coyula and Hamberg, 2003). In addition, there were 21,552 units in shantytowns, providing shelter for an estimated 72,976 residents, or 3.3% of Havana’s population (INV, 2001; Coyula and Hamberg, 2003). See Table 2. Most of Havana’s substandard housing is located in the inner city municipalities of Habana Vieja, Centro Habana, and Atarés. These areas are also characterized by high levels of population density and a disproportionate number of tenement buildings. In 1997, tenement buildings represented somewhere between 40% and 50% of all housing units in these neighborhoods, where 80% of all existing units are 80 years old or older (Padrón Lotti, 1998). In addition to Habana Vieja, Centro Habana, and Atarés, large concentrations of substandard housing are also found in the peripheral municipalities of Arroyo Naranjo, San Miguel del Padrón, and 10 de Octubre (Coyula and Hamberg, 2003). Although residents in tenements account for a relatively small share of Havana’s population, their dwellings tend to disproportionately suffer from overcrowding, disruptions in access to basic services, and deteriorating physical conditions. Population density, household size, and occupancy ratios provide another indicator of conditions in the housing sector. In the case of Havana, as in most major cities in the developing world, there seems to be a positive correlation between the presence of substandard housing and population density. During the 1980s, the city received a steady annual flow of 10,000 to 12,000 internal migrants (Scarpaci, Segre, and Coyula, 2002; Clark, 1999). See Table 4. This figure increased to 13,000 in 1993, and 17,000 in 1995, reaching a total of 28,000 by 1996 (Scarpaci, Segre, and Coyula, 2002; Clark, 1999). The majority of these migrants, popularly referred to as palestinos, originate from various parts of Eastern Cuba, and often come to Havana in search of better employment opportunities and consumer goods (Clark, 1999). In April 1997, the government approved Decree Law No. 217 to reduce the flow of internal migrants into Havana. It is estimated that as a result of this measure, some 22,000 inhabitants had migrated from the inner districts to the city’s edge by 1999 (Scarpaci, Segre, and Coyula, 2002). Although exact figures do not exist, some observers believe that the annual flow of internal migrants has subsided to 9,000 to 12,000 (Pérez Villanueva, 2000). In addition to overcrowded conditions, many housing units in Havana have difficulties when it comes to access to water and electricity. It is estimated that 17.5% of the residents in shantytowns do not have access to water inside their units, and 25.6% do not have their own sanitary facilities (Coyula and Hamberg, 2003). In Habana Vieja, between 30% and 40% of residents have to carry water to their dwellings; more than 25% of the existing units lack exclusive use of a bath or shower; 6% do not have toilets; and 15% share toilets located outside their units (Coyula and Hamberg, 2003; Morales, 1996). In many parts of the city, the water distribution system is unable to satisfy the needs of the population despite impressive statistics.3 Havana loses approximately 30% of its municipal water supply due to leaks and decaying infrastructure, and limited pumping capacity severely restricts the availability of water in many parts of the city (Driggs, 2004). Although virtually all residents have access to electricity, inconsistent electrical service, characterized by the infamous apagones or blackouts, is a common occurrence. Interruptions in electrical service became more frequent during the peak of the economic crisis of the 1990s, as the Cuban government began to modify its power plants to use domestically produced petroleum (Driggs, 2004). Domestic petroleum is high in sulfur content, which is very corrosive and requires frequent plant shutdowns for routine maintenance (Driggs, 2004). These shutdowns result in more frequent blackouts and service interruptions (Driggs, 2004). Finally, despite ambitious plans and efforts, Havana’s housing sector continues to be affected by growing deficits. Although official plans called for the addition of 400,000 dwellings to the existing stock between 1996 and 2000 at the national level, with new construction accounting for 250,000 units, and rehabilitation efforts accounting for the remaining 150,000, actual results during that period fell below projections (Scarpaci, Segre, and Coyula, 2002; Gomilla, 1996). Between 1997 and 1999, the number of new dwellings built in Cuba reached a total of 141,400, or 43% below the projected target (Scarpaci, Segre, and Coyula, 2002). This shortfall in production was attributed to several factors. First, the productive capacity of the construction sector fell short of demand, particularly as the result of lower cement output (Table 5) and reduced worker productivity; second, plants that once produced heavy prefabricated panels were not converted to facilitate the production of lighter building materials; and third, the construction of utilities necessary to support new housing structures fell behind actual completion (Scarpaci, Segre, and Coyula, 2002; Coyula, 2000). In addition to these difficulties, the present state of Havana’s housing sector can be attributed to several factors. Ordinary Cubans have little or no access to capital sources to finance home repairs and improvements. 4 There is also a limited availability of building materials. Although the purchase, sale, and transfer of residential units are technically legal, such transactions are severely restricted by existing regulations. These limitations have hindered the potential private development and have contributed to the expansion of an informal real estate market. These factors have contributed to one of the most pressing socioeconomic problems at the present time: the need to transform Havana’s housing sector and address the city’s housing crisis. One way to accomplish this objective, given the legacy of socialism in Cuba and legendary entrepreneurial spirit of Cuban people, is to facilitate the development of housing cooperatives. Housing cooperatives offer several advantages over alternative property forms, such as cost sharing, and professional management. In addition, they stimulate investment and capital formation by providing prospective homeowners and investors with powerful economic incentives, tax advantages, and the potential of future capital gains. Finally, the development of housing cooperatives can result in positive economic externalities through the creation of additional employment opportunities, higher tax revenues for the municipal government, and the multiplier effect associated with increased investment and consumption. Housing cooperatives differ from other property forms in several ways. First, owners in housing cooperatives own shares in a corporation rather than a real or tangible asset. These shares give the owner the right to occupy the corresponding unit (or apartment) for a pre-determined period of time, usually 99 years. The owner makes a monthly “maintenance” payment to the cooperative corporation, which includes his or her share of the underlying (building) mortgage payments, real estate taxes, and the operating costs of the building. In the United States, Internal Revenue Service (IRS) Section 216 allows the tenant-shareholder in a cooperative corporation to take a deduction for his or her proportionate share of the real estate taxes and interest payments made by the corporation (Zachter, 1989). If the buyer in a cooperative borrows money to finance his purchase, the mortgage obligation that he assumes is secured by a pledge of his shares in the cooperative corporation. From the point of view of the lender, shareholders in a cooperative bear a portion of the risk that other shareholders may default on their obligations to pay their share of the corporation’s expenses. This risk is often mitigated by giving the cooperative the legal right to place a lien on the shares of an owner for unpaid maintenance; however, even with this provision lenders still face the risk that the sale price may be too low to compensate the corporation for its losses. Cooperatives typically protect existing shareholders by placing restrictions on the approval of applicants. In some cases, the cooperative’s board of directors requires a buyer to pay a minimum of 20% or more of the total purchase price as down payment, regardless of the minimum down payment approved by his lending institution. In addition, most cooperatives also require buyers to meet a specific financing ratio, which limits their monthly personal debt, maintenance, and mortgage payments to a specified percentage of pre-tax income. The restrictions imposed by cooperatives are not only limited to financing. Some cooperatives do not allow pets, place strict limitations on subletting, and require written board approval for updates and improvements to individual units. Generally, these restrictions effectively reduce demand for units in the cooperative building. This reduction in demand typically has an adverse impact on the relative values of cooperative units when compared to alternative property forms such as condominiums and townhouses. Some potential buyers may also avoid buying shares in cooperative buildings because they do not want to disclose their financial situation to the building’s board of directors. In some cases, cooperatives that limit the amount of debt financing or leverage that potential buyers can obtain to purchase shares may cause individuals with limited financial resources to pursue less restrictive forms of home ownership. When buying shares in a cooperative, the bundle of attributes that the consumer purchases includes the unit and neighborhood characteristics, as well as a proportionate share of the common elements in the cooperative building (e.g., the roof, hallway, driveway, onsite laundry room, concierge, doorman, swimming pool, gym).5 This means that the total value of the cooperative unit is equal to the sum of its sale price and the unit’s share of the services offered by the common elements. However, calculating the value of a unit’s share of the services provided by the common elements can be difficult because they are not typically sold separately in the open market. The value of a cooperative unit is also determined by property-specific characteristics (i.e., the unique characteristics of the cooperative building and the unit being considered). Building-specific characteristics include design features, number of elevators, year constructed, building lot size, number of stories, type of exterior, fuel type used, zoning regulations, presence of doorman, concierge service, total number units, number of sponsor/investor units, and parking type. Unit-specific characteristics include square footage, unit design and distribution, number of rooms, number of bathrooms, location within the building, floor, balconies or terraces, ceiling height, etc. In addition to these characteristics, other key aesthetic externalities such as presence of a water view, the appearance of nearby improvements, and the quality of landscaping in the neighborhood as factors that influence the value of residential properties (Bourassa et al, 2003). Given their unique features and relatively simple valuation, housing cooperatives can contribute to the transformation of Havana’s housing market in several ways. Housing cooperatives represent a viable alternative for individuals wishing to enjoy the benefits of homeownership without the hassles associated with it, and can make significant contributions to the improvement of the residential housing stock. Since their residents own them, housing cooperatives offer economic incentives and social opportunities for individuals interested in controlling their social environment and improving the quality of their lives (Sazama, 1996). Because owners pay for their corresponding share of the benefits offered by the common areas, they have a vested interest in maximizing the utility or satisfaction they receive from their use or consumption. Housing cooperatives provide owners with powerful economic incentives to maintain and improve the physical conditions of their units and their common areas. This enhances the cooperative’s financial stability and contributes to its future viability. Like other real estate purchases and investments, buying a unit in a housing cooperative provides potential owners and investors with an opportunity to take advantage of the benefits of leverage. Leverage allows potential homeowners or investors with limited funds to acquire properties of substantial value. The disadvantage of leverage, however, is that it represents increased risk exposure.7 Some examples of such risk are a temporary decline rather than increase in property values, or a loss of employment, which could make it difficult for homeowners or investors to continue to meeting installment payments (Benke and Fowler, 2001). The use of leverage reflects the traditional risk-return relationship: higher levels of leverage can result in greater potential rates of return, but also represent greater levels of risk (Benke and Fowler, 2001). As financing opportunities become available, particularly for individuals with limited resources and income, the economic advantages of homeownership and investing in real estate assets increase substantially. Although relying on leveraged financing to buy a home or acquire an investment property may increase the borrower’s overall debt burden, the ultimate outcome is the acquisition of a tangible asset, which could generate future cash flows or could be converted into cash at some future point in time. The development of investment products (e.g., conventional and non-conventional mortgages) that allow individuals to take advantage of the benefits of financial leverage could serve as a powerful incentive to stimulate capital formation and alleviate Havana’s housing crisis. The development of cooperative housing projects could also provide employment opportunities in areas such as construction, management, maintenance, household services, and retail. New employment opportunities in the formal sector could provide an alternative to employment in the underground economy, and contribute to a cooperative’s financial stability and long-term viability. In addition to new employment opportunities, the development of cooperative housing projects also has the potential of increasing Havana’s tax base. This can be accomplished by providing tax incentives to facilitate their development and designing and building spaces that include ancillary facilities such as retail shops, restaurants, and storefronts to meet the needs of local residents. The development of “mixed use” cooperatives (i.e., cooperatives occupied by both residential and commercial tenants) can contribute to the city’s tax base in the form of additional property taxes and taxable consumer spending. A portion of these tax revenues could be allocated to the improving and maintaining Havana’s infrastructure and providing additional social services, resulting in positive externalities. Property Rights: The transformation of Havana’s housing sector, regardless of the type of property form used, will require the expansion and guarantee of private property rights, the elimination of existing restrictions on homeownership by ordinary citizens, and the liberalization of the real estate and construction markets.8 The importance of property rights in this context cannot be understated because property rights are the sine qua non of residential housing market development in both advanced and developing economies. A well-established system of property rights also facilitates the conversion of assets into fungible capital, and constitutes a fundamental requirement for capital formation. According to de Soto (2000), a formal system of property rights begins to process assets into capital by describing and organizing the most economically and socially useful aspects about assets, preserving this information in a recording system—as insertions in a written ledger or a blip on a computer disk—and then embodying them in a title. A set of detailed and precise legal rules governs this entire process. Formal property records and titles thus represent our shared concept of what is economically meaningful about any asset. They capture and organize all the relevant information required to conceptualize the potential value of an asset and so allow us to control it. Property is the realm where we identify and explore assets, combine them, and link them to other assets. The formal property system is capital’s hydroelectric plant. This is the place where capital is born (pp. 46–47). In most countries property rights are defined or assigned through a formal legal system, or by less formal mechanisms such as customs or traditions. Two areas of property law that have a direct impact on the development of real estate markets are contract law and land use regulation. Contract law deals with the system that defines and facilitates the transfer of real property and property laws allocate those rights, and settle disputes and disagreements (Malpezzi, 2000). Research by Miceli and Sirmans (1997) shows that substantial efficiency gains are possible when countries institute systems that create official property registers and provide some form of private insurance or public guarantee to back property rights. Regardless of its level of economic development, a nation’s property market is said to be a well-functioning if the process of price discovery is complete and contributes to the reduction of the risks involved in purchasing and financing real estate assets (Bertaud and Renauld, 1997; Malpezzi, 2000). Price discovery is simplified and its costs are reduced when the required institutions for efficient property markets, such as property registration and insurance service providers, mortgage lenders, and real estate brokers, are present and encouraged. • Detached house or second floor walk-ups—interest rate, 3%; term, 15 years. • High rise buildings—interest rate, 2%; term, 20 years. • Mountain rural cooperatives—interest rate, 2%; term, 25 years. • Other rural cooperatives—interest rate, 3%; term, 30 years. • Self-help housing—interest rate, 3%; term, 10 years. To facilitate the transformation of the housing sector, other participants (both domestic and foreign) should be allowed to offer various types of financing to existing and potential homeowners. Under this scenario, lending decisions would be based on the borrower’s credit (or risk) profile and history, and the lender’s cost of capital and tolerance for risk. This transformation will also require the development of a market for mortgage-backed securities (MBS), collaterized mortgage obligations (CMOs), real estate investment trusts (REITs), and other types of financial derivatives. The development of a market where these financial instruments could be easily traded can inject much needed capital and liquidity into the system (Buckley, 1996; Renaud, 1999). Unsettled Property Claims: The third challenge that needs to be addressed consists of unsettled property claims. There are scenarios under which this highly sensitive issue may eventually be addressed (Ashby, 2004). One possibility is for claimants to receive substitute restitution, by which they would be granted another property of equal value to the one originally confiscated by the government. Compensation could also take the form of cash payments to individual claimants equal to the fair market value of their respective properties. Another scenario is for the government to make a lump sum payment to an entire class of claimants, from which qualified individuals would receive payments. A final possibility is for compensation to take the form of redeemable vouchers, debt securities, or shares in privatized business firms. Despite the influx of foreign investment into tourism and commercial real estate projects during the 1990s, conditions in Havana’s residential sector have continued to deteriorate. By the end of 2001, more than 90,000 housing units were considered in “poor” condition, and an estimated 60,000 were in urgent need of repair. The city’s sub-standard or slum housing included more than 7,000 ciudadelas and cuarterías, and 186 barrios insolubres, providing shelter to more than 90,000 inhabitants. Experts believe that some 1,000 dwellings suffer partial or total collapses every year due to poor maintenance, years of neglect, and the severity of tropical storms. Although the majority of habaneros have access to electricity in their homes, service interruptions have become an almost daily occurrence, causing food spoilage and intensifying the effects of summertime heat waves. In the inner-city municipality of Habana Vieja, more than 30% of residents have to carry water to their home, and more than 25% of the existing units lack exclusive use of a bath or shower. Finally, it is estimated that 25% of the residents in the shantytowns located in the city’s peripheries do not have their own sanitary facilities, and 17% lack access to water inside their units. The current condition of Havana’s housing sector can be attributed to several factors. First, ordinary Cubans, with the exception of those receiving generous remittances from abroad and those with substantial hard currency earnings, have very little access to funding for home repairs and improvements. There is also a limited availability of building materials in state-owned stores. Finally, and perhaps more importantly, most transactions involving residential properties are strictly regulated by the state. The development of housing cooperatives can also create positive externalities associated with new employment opportunities and additional tax revenues. By creating additional employment opportunities in the formal sector, housing cooperatives can provide an alternative to employment in the underground economy. The development of housing cooperatives can also increase Havana’s tax revenues. Part of the resulting tax revenues can be used to improve the infrastructure and provide additional social services to the city’s residents. Finally, housing cooperatives have the potential of bringing investment into the housing sector, and stimulating capital formation through increased private homeownership. However, three principal challenges remain in the near term. First, the transformation of Havana’s housing sector will require the elimination of existing restrictions on homeownership, the expansion of private property rights, and the development of an efficient system of property records. Second, this process will also require the presence of independent intermediaries capable of offering various financing options to potential homeowners and investors, and the development of financial markets where diverse financial instruments could be exchanged. And third, unsettled property claims should be addressed during the early stages of transition to reduce the uncertainties associated with restitution, compensation, and pending litigation. 1. According to Coyula and Hamberg (2003), there were 5,381 partial or total collapses in Havana during the 1993–1996 period. By contrast, in 2000 alone, the city lost some 4,064 units due to partial or total collapses or derrumbes. 2. According to a report compiled by the Instituto Nacional de la Vivienda (INV) in 2002, the number of housing units considered in “bad” condition in Centro Habana ranged between 7,000 and 8,000, while the number of units in similar conditions in Habana Vieja ranged between 16,000 and 18,000. 3. According to the Instituto Nacional de Recursos Hidráulicos (National Institute of Hydraulic Resources), 98% of the urban population receives water service; 83% enjoy a direct connection within their homes; and 14.8% have “easy” access to water (i.e., can access a water source within 300 meters of their homes). 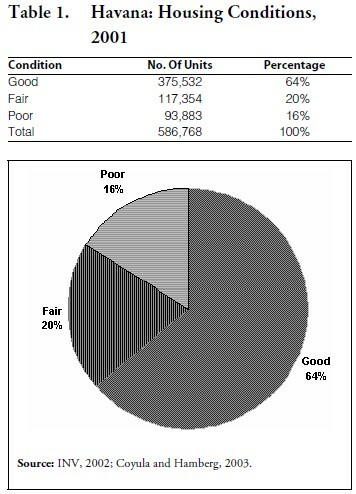 See Driggs, 2004, and Pan American Health Organization (PAHO), 2000.
εint = an error term with the usual properties. 6. The average yield on a one-year U.S. Treasury Bill during the observation period provides a good approximation for the annual discount rate (i). Similarly, the average inflation rate during the observation period can be used to represent the expected growth rate (g). 7. Leverage in the context of personal real estate purchases or investments is defined as the ability to use a relatively small cash down payment to obtain (or control) property of substantial market value. 8. Article 2 (Law No. 65) specifically limits homeownership to a primary residence and a secondary (summer or “rest”) residence. This law strictly prohibits legal ownership of more than two residences.